Perhaps even more than the Boston Red Sox, the New England Patriots are the team of the entire northeast from Rhode Island to Canada. 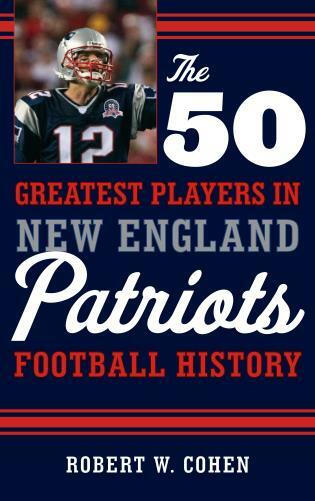 Here, sports historian Robert W. Cohen ranks the 50 best players to ever take the field for the Patriots. Who can forget Wes Welker, Troy Brown, Jim Nance, Ted Bruschi, and Tom Brady. They're all here in this fascinating collection of bios, stats, quotes from opposing players and former teammates, photographs, and recaps of memorable performances and seasons. This book is a must-read not only for Patriots fans, but for all fans of professional football. Sports historian Robert W. Cohen began writing professionally in 2004 and has written numerous books, primarily on the sports of baseball, football, and basketball. Robert has appeared on numerous sports-talk radio programs around the nation to discuss his published works. He lives in Clifton, New Jersey.